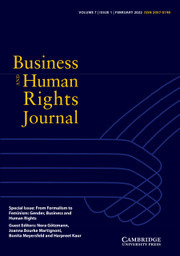 NEW IN 2016 - The Business and Human Rights Journal (BHRJ) provides an authoritative platform for scholarly debate on all issues concerning the intersection of business and human rights in an open, critical and interdisciplinary manner. It seeks to advance the academic discussion on business and human rights as well as promote concern for human rights in business practice. BHRJ strives for the broadest possible scope, authorship and readership. Its scope encompasses interface of any type of business enterprise with human rights, environmental rights, labour rights and the collective rights of vulnerable groups. The Editors welcome theoretical, empirical and policy / reform-oriented perspectives and encourage submissions from academics and practitioners in all global regions and all relevant disciplines. A dialogue beyond academia is fostered as peer-reviewed articles are published alongside shorter ‘Developments in the Field’ items that include policy, legal and regulatory developments, as well as case studies and insight pieces. National Action Plans on Business and Human Rights: Progress or Mirage? Certifying Private Security Companies: Effectively Ensuring the Corporate Responsibility to Respect Human Rights?